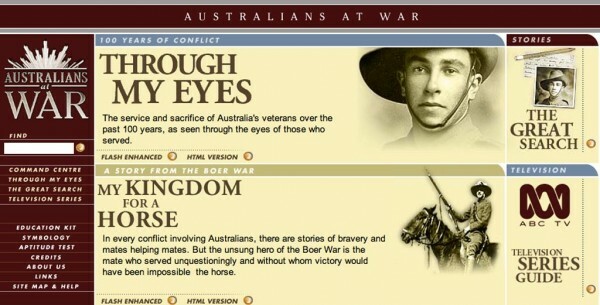 When teaching the history of Australia’s role in significant conflicts such as the Second World War there are a number of web sites that I and my students turn to as part of our programme of exploration and investigation. To begin, Australians at War and Fifty Australians are two sites that I share with my students when teaching the Stage 5 Australian History course in NSW. The sites are suitable for all students. They are particularly relevant to my students in Years 9 and 10 History when we explore the involvement of Australians in the various international conflicts that took place during the twentieth century including the First World War, the Second World War and the Vietnam War. 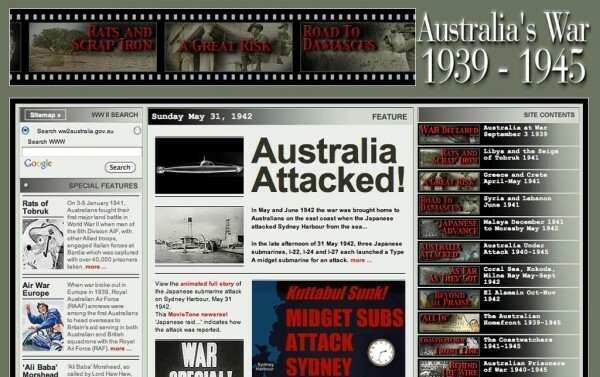 Australians at War was created in support of an Australian documentary series that aired back in 2001 however the site has a life of its own. The richest components of the web site include the numerous video and audio recordings of the soldiers, nurses and civilians that experienced the various conflicts. There are also letters, documents and transcripts to support the embedded media. These primary sources provide a wealth of original material for students and teachers to consider and evaluate. The web site also features pdf based resources for teachers, three games for students, an aptitude test and a page where you can construct your family’s war history. I was hoping that the family trees of other visitors to the site would be available to view however they are not. Each component is available in a flash or html version. Some of the Quicktime media for the oral history recordings was not available however one can simply select the Windows Media Format material in that case. Transcripts are also available so that students can both read and listen to the first hand accounts of events during the conflicts. Fifty Australians is simply that. It provides biographies of fifty quite diverse Australians and illuminates how various conflicts ranging from the Great War through to the Vietnam War and beyond affected their lives. 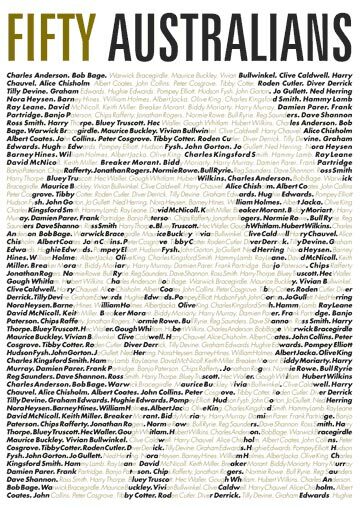 The individuals include ordinary men and women, politicians, rock stars and rogues. Individuals include Charles Anderson, Sister Vivian Bullwinkel, Gough Whitlam, Albert Jacka, Sir Charles Kingsford Smith, Tilly Devine and Chips Rafferty. Each biography is well written and features photographs and links to related resources at other web sites. A third site that I like to share with my students includes Australia’s War 1939-1945. This site was established by the Department of Veterans’ Affairs. The opening page takes the form of a magazine or newspaper style publication. Readers immediately have access to news stories, artwork, biographies and information resources. The site contents are located in a sidebar on the right hand side of the opening page. Once within the site the navigation switches to an interactive menu located on the upper left of each page. The site is well illustrated and incorporates interactive media such as audio recordings from the period of the Second World War. A number of the images can be enlarged. The section that deals with the actual enemy attacks that reached our shores is particularly useful for students studying History in Year 9 in NSW. The Imperial War Museum in London has an online exhibition that deals with the Gallipoli campaign of 1915 during the First World War. This disastrous campaign led to many Australian and New Zealand casualties. The site incorporates photographs and accounts of the campaign as well as maps and recent video footage of the area. 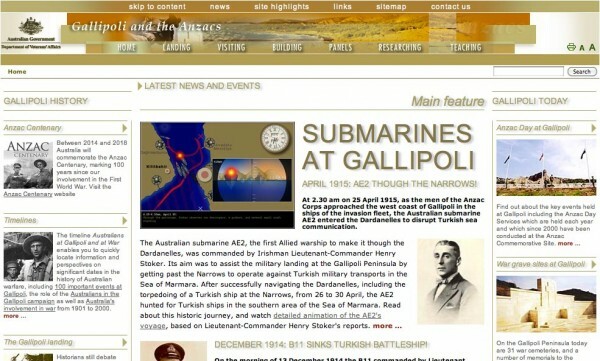 The design of the web site is not brilliant yet it provides an another view of the Gallipoli campaign for students. A much better site for exploring the role of the Anzacs during the Gallipoli campaign is Gallipoli and the Anzacs. This rich web site incorporates useful timelines, artwork, resources for teachers, interesting facts and stories, plus information regarding visiting the present site. There is much more as well for readers to explore. There is only one pitfall to the site. Navigation is confusing with both horizontal and sidebar based navigation options. Navigation and menus could be rationalised. Very interesting material. I will definitely use some of this stuff when I teach Gallipoli next year. I’ll have to search a bit more, but it would be neat to access some information on Australia’s contribution to the Vietnam War. Along with S. Korea Australia provided quite a number of troops there and it would be interesting to read some of those primary sources. I am yet to transfer these resources to my new site. You may be interested in this site about my father who was a veteran of WW2.